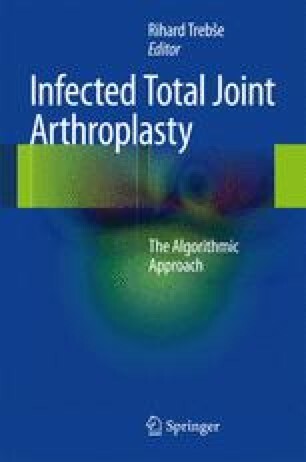 The most important issue in treatment of PJI is the correct evaluation of the patients and the decision about the appropriate treatment strategy, namely, debridement and retention, one-stage exchange, two-stage exchange, permanent resection arthroplasty, and permanent antibiotic suppression. The chosen strategy determines the final functionality and clinical results but the probability of infection cure as well. In general, more aggressive treatment results in poorer functionality but better chance of eradication of infection. This is not true for all subsets of patients. The algorithm helps to discriminate which patients would have an acceptable probability for eradication with less invasive treatment strategy. The goal is to apply the strategy that gives the best function without trading-off the probabilities of permanent infection cure too much. AAOS (American academy of orthopedic surgeons). The diagnosis of periprosthetic joint infections in the hip or knee. Guideline and evidence report. 1st ed. Rosemont: AAOS; 2010. http://www.aaos.org/research/guidelines/guide.asp.